This certification mark is awarded within the scope of voluntary testing and certification. It is defined for GNSS (Global Navigation Satellite System) constellation simulators which generate a configurable GNSS RF signal. Technical requirements for laboratory equipment e.g. EN 61010, EN 60417-1 (electrical safety, graphical symbols), are additionally validated. It is verified that the level of the configured signal parameters (e.g. 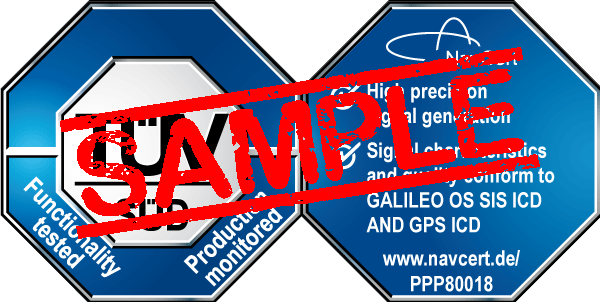 signal level) is within the specified tolerances for signals generated by the GNSS constellation simulator. It is verified that the signal characteristics (e.g. modulation, bandwidth, frequencies) and the signal quality (e.g. phase noise), are conform to the signal structures as defined in the applicable specification documents. By this the simulator is able to generate a configurable GNSS RF signal which is conform to the specification. Receivers connected to the simulator will be able to interpret the signal correctly to determine a simulated user position or the configured satellite constellation.